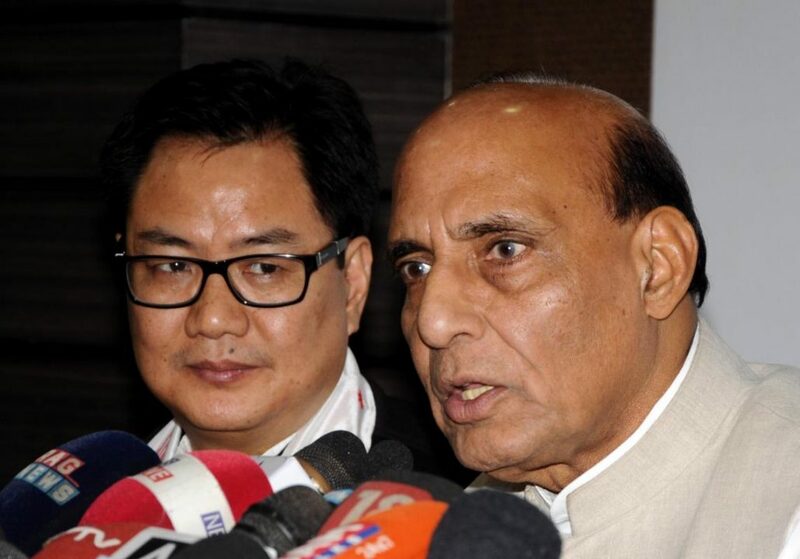 File photo of Union Home Minister Rajnath Singh (Right) and his deputy Kiren Rijiju. Taking major core issues in hand, Union Home Minister Rajnath Singh will reach Dhakaon Fridayon a three-day visit. According to the sources, Singh during his stay in Bangladesh is likely to discuss issues related to radicalization of youths by the terrorist groups, border issues, fake currencies, border killings, cattle smuggling, visa issues, movement of illegal immigrants and Rohingya issues among others. “The Home Minister will also discuss ways to further strengthen the mutual cooperation in preventing terrorism,” a Government official said. A 12-mmber high level delegation consisting of Indian home ministry officials and top the Border Security Force (BSF) officials are likely to accompany Rajnath. Bangladesh Home Minister Asaduzzaman Khan will receive Singh at BAF Base Bangabandhu on his arrival in the afternoonon Friday. Rajnath will meet Prime Minister Sheikh Hasinaon Saturdaymorning to discuss issues of mutual interest between the two countries during his visit. Home Minister Singh along with his Bangladesh counterpart will open a mega Indian Visa Application Center at Jamuna Future Park in the city after his meeting with Premier Hasina on the same day. State-of-the-art IVAC will have 50 counters together giving an opportunity for around 700 applicants together. On Saturdayafternoon, Home Minister Singh will visit Bangladesh Police Academy, Sardah. Singh will have meeting with his Bangladesh counterpart Asaduzzaman Khan to discuss core issueson Sundaymorning. Rajnath will visit Bangabandhu Museum to pay respect to Father of the Nation Bangabandhu Sheikh Mujibur Rahman before the meeting. He will also visit Dhakeshwari Temple and will offer prayers there after visiting museum. The Home Minister’s visit might see signing of three bilateral cooperation documents including revised travel arrangements 2018.